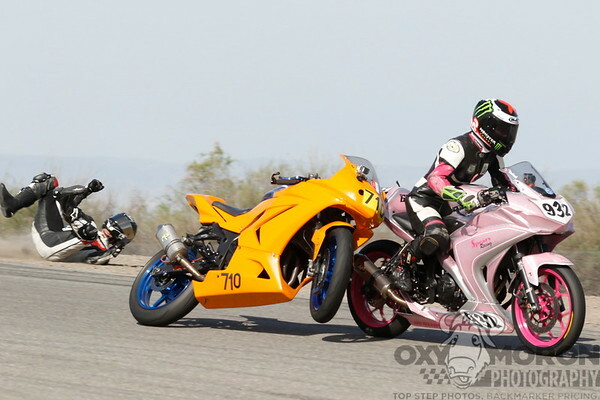 AHhahahhh, that happened at Buttonwillow race last month. Novice rider tried to pass Rachael coming out of Riverside but wasn't close enough and didn't have enough speed. She didn't see him and dove in, knocking him off bike. His bike ended up hooked on tail section of her bike. She shook it off in runoff and kept on going! Wow!! Amazing she kept it up and kept going, well done!! Timing is key for me. If I come up on them too close, I have to brake and lose lots of momentum. Better to plan several corners ahead and leave a slight gap. Then I can keep speeding up around previous corners and use that extra speed to pass them just as I'm about to rear-end them. So here's the thing. What tends to happen with your vision when you approach a slower rider? Where does your attention go? It goes to the rider right? And then you end up braking and losing momentum. What if you could train your eyes to NOT to look at the rider in front directly but to see the space available around them? Do you think the timing issue would get better and that you wouldn't end up having to brake? Ideally, I'm looking where I want to go as if I had clear track. 5) I do not profit. Staying focused on my line works best for me when I'm with other 300s. Gauging the potential speed differential for different bikes, especially when I'm unsure of how much the other rider will or won't roll on the throttle, is still a huge work in progress for me. Haha. Working on it. Working on it. In turn-in area news, I'm playing a new game with speed bumps in the parking lot at work. The speed bumps have a 2-3 feet flat channel in the middle. I'm playing with looking ahead as early as possible once I'm reasonably certain of hitting the flat section, and playing with different speeds. Hahaha, I love your description of what happens when you approach a rider. The IDEA of looking where you want to go as if you had clear track is ok but when you have a rider in the way of the line you would take if you had a clear track then you get thrown out of whack. 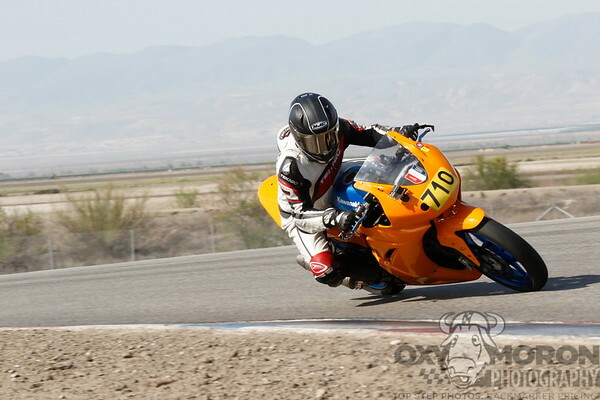 What we teach at the California Superbike School is to try and WIDEN your vision. What usually happens for riders when they approach a slower person on track is that they look at the rider and their vision narrows. A narrow field of vision will not only cause you to target fixate on the rider and follow them but it will also distort your sense of speed and perception. So widening your vision allows you to still keep track of the rider you want to pass with your peripheral vision but also see the available space around them. Without allowing your vision to narrow, your sense of speed is better and you can then judge how much time you have better then if you have a narrow field of view. Does that make sense? How do you think you could practice widening your vision and passing safely? It makes sense, and I'm still trying to rewire my brain to force out bad habits. In terms of practice to remind myself about wideview, I ride with the peripheral vision stars from the WVLS drill still. Heck, I even taped muted blue painters tape squares on my visor last year for a CCS race. I thought gold stars might draw attention at Tech. Haha. In terms of the rider in front situation, I am hoping that practicing looking ahead even farther down the road when I have certainty of the turn in area instead of an exact point will help with looking through the rider. By moving the vision farther ahead on the road, I'm also providing a larger peripheral field that the other rider can be in, to better gauge differences in speed. Is that headed towards the preferred thought process? Maybe I'm incorrect in my self-assessment, but I also feel like part of my issue is just needing more seat time experience with gauging closure rate with peripheral vision. 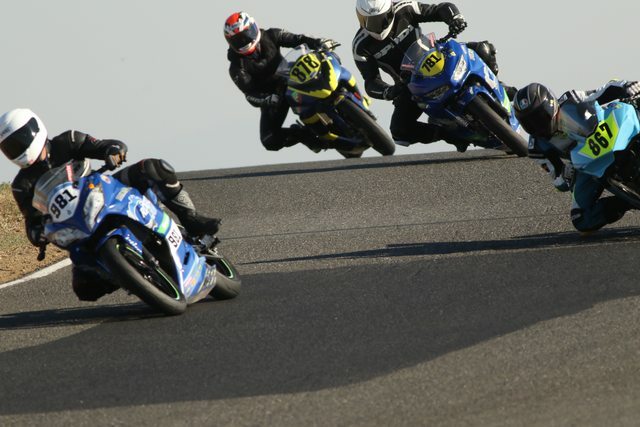 At trackdays, even after following and trying to set up passes, I usually leave large gaps on entry and mid-corner as I'm concerned about the potential of the gap closing up real quick on some riders. When I have the "pass corner" chosen, I try to see how the situation looks when I get on the gas post entry. What this can result in though is that I end up with more ground to cover as the door is opening, and not committing to an underneath drive as I get nervous about the rider coming back across and pinching me off by the time I draw alongside for a right/left or v.v. situation. The extra ground can also lead to the bad habit of second guessing as we're headed towards the next door closing moment for the following corner. I'm going to try and squeeze in another CSS day this year, maybe September at Thunderhill, to see if I can make more progress. Signed up for Thunderhill with Keigwin's @ the Track for October 6/7. The last time I was at Thunderhill was probably 2007. Anyone else here going to be there? It would be cool to get a tow from another small bike. I also signed up for an AFM license. Depending how my lap times look after the K@TT trackdays, I may try to make the last round of AFM and get some more experience in. Also, I picked up a set of Q3+, so we will see how they compare to the Alpha13. Doing Buttonwillow on 15-16 Sept.
Then final AFM-Rnd7 Thunderhill 20-21 Oct. Looking forward to seeing you @ Rnd-7, it's a relatively easy track with wide-open corners. Super cool. If I can easily run under a 2:30 lap time, I'll definitely plan to attend to Round 7. I just have no idea of my lap time right now. Now, I just have to start prepping the bike. CCS was a lot less detailed on safety wiring requirements, so that will have to be done. Just ordered some 3oz translucent bottles to fashion a catch can for the coolant overflow. Next up, some new handle bars to fit a guard. Cool. Maybe use some of the track time to work on your visual skills and practicing trying to see the space available to pass instead of the space that is taken up by the rider. If you are able to get closer ahead of your "pass corner" then you will have more time and space available to get by without having to make it all up AND pass. A lot of this will depend on how much attention you put on the rider in front of you and where they are. When I approach a rider I try and see the amount of space around them and put as little attention on them as possible. With my peripheral vision I keep track of where they are and where they are going and try and choose passes where the door is opening as opposed to closing (during track days, not racing). Anytime you focus on the rider in front and allow your vision to close in on them, even for a split second, you have lost valuable time. Let me know how it goes and have fun!! Thanks, @Misti ! It is definitely still a work in progress, but I felt that there was some improvement. I caught myself tunnel visioning in on the rider in front a few times. However, whenever I did, I worked on keeping a wideview and looking past the rider for the next corner, while keeping tabs on them with my peripheral vision. A few times, I definitely felt the difference in increased visual cues and faster cornering speed while making passes by keeping the wideview rather than forgetting and focusing on the rider in front. Also, no questionable passes on my end this time. Main take-away: Don't forget good arm/body positioning to help with a fast quickturn turn-in. I went to Thunderhill to learn the track and see how my laptimes would look. I went with a particular eye towards trying to catch the last AFM round of the year. Local AFM 300 club racers said that consistent lines with laptimes below 2:30 would be safe for racing, so that was the baseline target for the weekend. The weather was nearly perfect, except a little bit windy. I was able to make steady improvement on Day 1 down to 2:28. I was focused on trying to learn the lines while keeping the turn-in area in mind. I still have to work on turn-in area, as it was brought to my attention on Day 2 that I was early apexing some corners when I should really be focused on getting a better drive out onto the main straight. As a side note, the Carter@TheTrack folks were awesome. Coaches were highly visible and friendly. They also hosted a buffet dinner with beer on Saturday night. The dinner was a great chance to meet and talk with other riders, and chat with the organization staff. On Day 2, Jason from Dunlop Tires mounted a set of Q3+, and I set about trying to build off day 1. I spent a few sessions riding with a 250 rider I had met the night before, and we both learned from each other in terms of the give and take in different sections of the track. I was able to get down to a 2:25 by lunch time. After lunch, I was able to get a tow and some lead-follow from one of the instructors, Frenchie, and he critiqued a few areas he saw I was particularly slow in. To make it a point, he passed me on the outside of T1 just to show me how much speed I was giving up. The coaching was definitely helpful as I immediately dropped 2 seconds and started running consistent 2:23 laptimes. Based on Frenchie's feedback and some retrospective thinking about where I "felt slow," I definitely feel like there are a few spots for easy time gains next time out. The last session ended up being a slow session because of combined groups due to a red flag in the previous session, so I wasn't able to piece it all together. But since I was able to run 2:23s, I decided to take the plunge and signed up for the last AFM round. As Dylan Code says, the fastest way to get faster for racing is to just go racing. Also, I had a nice chat with the suspension legend that is Dave Moss. I went to ask him about how to think about the balance between suspension upgrades and rider upgrades. I went primarily as I have uneven wearing with the stock suspension, and wanted to hear his thoughts on adjustable suspension versus a rider trying to learn to get the most out of the stock set up. 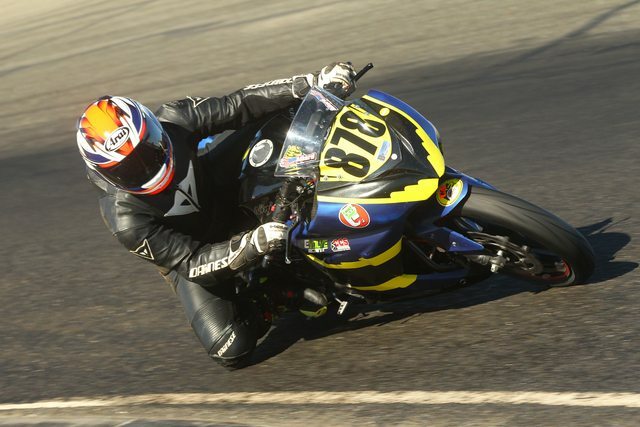 His advice was to really focus on rider improvements until around 2:15 laptimes at Thunderhill. At that point, he thought I might start understanding where the suspension gains are to be had. So the new goal is now 2:15. With the positive weekend, I will try my hand at the AFM round this weekend, and look forward to learning more from the other 250/300s riders. Based on the more recent races, it seems like I'll be at the tail of the pack, but that means there's only forward progress possible. Nice! Great progress and update! Takeaway - I still need to practice quickturn turn-in handbar inputs and "screwdrivering" the inside hand. I made it out to the final AFM round of the year. It was awesome. I will definitely be back. In a nutshell, I met some great people, dropped six seconds off my laptimes from two weeks ago, and had a lot of fun. First of all, Tech. Thankfully, I got through Tech without a hitch. All I needed to do was to RTV the timing chain tensioner bolts, but otherwise I made it through unscathed. From the tips and introspection from the trackdays two weeks prior, I was able to get down to the high 2:18s in practice. I ran a best of 2:23 at the trackdays previously. I thought this would bring me closer to the pack. However, it being the end of the year, the other racers in the Saturday race were running 2:14 or better. Sunday is a new day though, and I was happy to not finish last in 3 of 4 races in the weekend. One set of corners in particular, T6-T8, was a particular area of focus for me. Previously, I was on the gas from T6 to T8, but taking T8 in the top of 5th gear. As the track goes uphill after T8, I was losing steam in 6th gear. However, on Sunday, I committed to keeping corner speed up in T6 and was able to get an extra 5MPH (indicated) though T8, allowing me to take it in 6th and keep accelerating up the hill. Unfortunately, this also meant if I screwed up a lap, I suddenly found myself losing steam very quickly after T8. In the first of three races on Sunday, I was able to make a pass and two riders crashed out while in front of me, moving me up three positions by race end. In the second race, I was able to make a pass on a Ninja 400 and open a small gap. The third and final race was the most fun as the Ninja 400 rider dropped time and we both ended up making several passes on each other while running 2:17s. The Ninja 400 definitely pulled a lot stronger, as I could barely maintain position in a draft whereas he had power at will on the straights. By the end of it all, I was getting the bike leaned over and committed to the point of dragging the pegs in some of the corners. I was definitely faster in the back section of the course, but was getting a bit mentally exhausted and was losing time in T1 and T2. Luckily, I was able to hold my position down the back straight, running a defensive line and forcing him to try to go around the outside, and I held him off by 0.4 seconds across the line. If I could string it all together with a fresh mind, I think I should be able to get into the 2:16s next time. However, I'm now trying to figure out the next step of where to find the gains as I was knee down in all corners and already dragging peg in some. The fastest expert rider was another 13 seconds a lap faster, and the fastest novice is about another 9 seconds up the road. With 34 horsepower, I will need significantly more thought on where to find the extra time. I think maybe an adjustable suspension and a bike properly sprung for my weight might buy me a second or two, but there is still a lot of rider improvement to be done. At the same time, I am definitely starting to think what I want to run next season. My bike has a stock suspension right now, and it does not make sense to drop money into a 34hp bike if the small bike class is moving towards the Ninja 400 with 43hp. Based on when I was behind the Ninja 400, I was definitely getting a better drive off the corner but he was able to power up alongside on the long straights when he was behind. We will see how the rulebook shakes out, but maybe a different platform/class will be in the plans for next year. Either way, I consider it a successful weekend and will plan to spend 2019 learning the AFM tracks and returning for racing. I'm signed up for the weekend after Thanksgiving to learn Buttonwillow. In terms of the mental game of passing, I feel like I made improvements as I was able to focus on the track more. The back and forth with the Ninja 400 rider in the last race helped me to keep focus on the track rather than looking over at the other rider. My passes were usually started around the outside of the preceding corner to set up for an inside pass when the track switched back from left-right/right-left. At least this photo makes it look like I'm focused on the track (878 in the back). Yay!! Great progress and updates! keep em coming! CSS 2019 schedule is up and posted, I'll be coaching the first two dates in Last Vegas....anyone coming? Any chance you will look into taking a school with us this year? I love to meet people from the forums in person! Oh, and feel free to ask questions or point out any concerns. I love chatting about riding when i'm not actually doing it! Thanks, Misti! I'm hoping to cornerwork the March and November Vegas dates. Are you coaching the March days? Unfortunately, I can't make the February dates. In terms of taking another L4 class, I'm not sure. I have the June 8/9 days at streets marked on my calendar for now. I can't do weekdays, the early Streets dates all clash with AFM race weekends, and the 2-days are a bit outside of my budgeting. I'm still working on the vision and passing issues we worked on last year at Streets, and I'm trying to be better about only using peripheral vision for the rider in front rather than actually glancing at them. 4. More power to improve on the parts of the track that those above do not make the difference. So Tyres & suspension are better than HP especially on a track with small straights & mostly corners. Good luck, I no it all costs money, but there are ways to short cut that. Later or other model bikes have cartridge forks, replacing damper rods with cartridges, allows a lot more adjustment just using oil viscosity & far better control, correct springs for your weight are cheap. Reading about cartridge adjustments, can allow you to set them up & or change a few basic parts to get better adjustment. Then find a good setting for you & learn to ride it, don't twiddle knobs or adjustments because they are there.Likewise don't mkae timy adjustments, be bold. If you think something is too soft, whack a good adjustment on it, then see if that made it to hard, don't add nibble adjustments because you won't be able to feel the change, you can always back off if you went to far, but you need to be able to feel the difference ! If you went up 10 clicks & now to hard go back 5 & try it. It makes it quicker to zone in on the correct adjustment range ! Good luck, I no it all costs money, but there are ways to short cut that. Later or other model bikes have cartridge forks, replacing damper rods with cartridges, allows a lot more adjustment just using oil viscosity & far better control, correct springs for your weight are cheap. Definitely agreed and thanks for the thoughts. Previously, I was more focused on getting my riding abilities closer to the realm where I would really "need" the improved suspension. In photos, it was definitely clear that my bike had a nose-up attitude due to my weight and the rear suspension, thereby probably slowing turn-in slightly due to the increased rake. But the increased rake definitely wasn't the primary cause of my lap times. As you say though, everything costs money. It's why I bought an R6 for next season instead of pouring more money into the 300. The R6 has fully adjustable gas charged front forks and a fully adjustable rear shock, and is actually sprung for a rider of my weight. Now, there will be no excuses next season as the bike will have the best tires, best suspension, and strong braking. Now it is all on the rider to improve. Haha. Hey! I'll be at the March dates so maybe see you there!! Awesome! I am officially assigned for cornerworking the March dates, so I'll see you there! Once March rolls around, and work slows down a bit, I'm sure I'll be posting up new questions. The R6 just came back from the frame shop this week as a roller, so now I need to find time to put it all back together before a trackday the week before Vegas. For now, a quick question. I think you coaches used to (still do?) run Dunlop slicks takeoffs? How quickly, or how much, do you find the slicks to warm up in the morning with the 3/4, no brakes session on an average March LVMS days? I'm not sure I'll be able to run warmers while cornerworkering out there, and am wondering about not being able to get on the brakes firmly in the early sessions to warm up that front tire. Both sets of my rims are currently mounted up with Pirelli SC1 (soft) and SC2 (medium), so softer carcass than Dunlop. P.S. The Ninja 300 is sold off to a new owner, so technically this thread won't be in compliance with the forum going forward. Maybe it's time I switched this over to a blog or the superbike school forum. Haha. Cool! Looking forward to saying hi! As for the tires, yes coaches use Dunlop Slick take off's for the most part unless it's raining and we get Q3's like the students. They do take a while to warm up for sure and we have to be very careful/conscious of the fact that they don't warm up like our student tires. I try and give myself lots of time to get them at least a bit warm before leading a student and we need to remember that when we stop on the side of the track to wait for them, that we have to be extra careful pulling back on track at speed and not dumping it in the next few turns due to the tires cooling back off again!!! Just take your time to slowly build heat and you should be fine!